It ferociously guards the wasp pupae, protecting them from threats by flinging itself at predators, and it will sacrifice its life to nurture the wasps to adulthood. Another example of a parent subjugating its own interests, to pass on its genes for subsequent generations? No. This isn't the parent of the pupae. This protector is not even of the same species. It's a caterpillar that has been parasitised. Its normally self-preserving behaviour has been subverted to such an extent that it's become a suicidal babysitter and obsessive bodyguard to its nemesis. Evolution has provided the natural world with an astounding array of parasitic interactions, few of which are as spectacular as those where the parasite manipulates the behaviour of its host. Consider, for example, the larva of the nematode hair-worm, which infects grasshoppers and crickets. To continue its life cycle, it needs an aquatic environment and so appears to induce the insect to drown itself in a nearby water source. The eye stalks of snails parasitised by the green-banded broodsac flatworm are infested by the flatworms, making the stalks mimic squirming caterpillars or worms. Blinded, the snails no longer avoid sunlight, and wander into view of predatory birds which provide the next host for the flatworm. 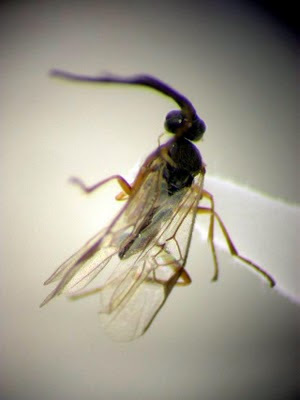 Now researchers from the University of Amsterdam and the Federal University of Viçosa, Brazil, led by Arne Janssen, have described a situation where the host actively protects the parasitoid that will ultimately kill it. become—an unlikely event if the parasitoid wasp Glyptapanteles comes to visit. The case of the suicidal babysitter begins with the infection of a caterpillar, Thyrinteina leucocerae, by an adult wasp (Glyptapanteles sp. ), which inserts its ovipositor into the fluid within the body cavity of its victim and deposits its eggs. The caterpillar continues to feed and grow, while the wasp eggs inside it hatch into larvae. Two weeks later, around eighty wasp larvae emerge from the caterpillar, and spin cocoons nearby, ready to pupate. A Glyptapanteles larva emerging from a caterpillar. One might think that this would be the end for the caterpillar, but the wasps haven't finished with it yet. The caterpillar now stops eating and moving. 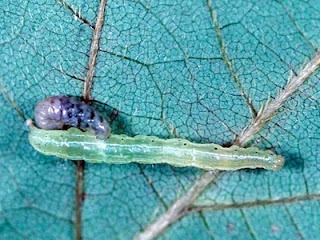 When a predator of the wasp larvae appears—such as a stink bug—the caterpillar violently swings its head around, frequently knocking the predator off the twig. Then, once the wasps have emerged from their cocoons, now in adult form, the caterpillar rapidly dies. While it certainly appears that the wasp larvae is manipulating the behaviour of its host for its own benefit, demonstrating this has proved difficult, especially in the field. 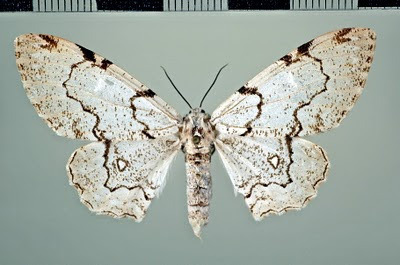 It is possible, for example, that the caterpillar's behaviour is simply a side-effect of the infection, or even that the wasp chooses caterpillars that already display abnormal behaviour. With these issues in mind, Janssen and his colleagues undertook a range of experiments both inside the lab and in the field to test the interaction of the two species. Their results were strong. Not only were they able to show that there is no pre-existing characteristic of the parasitised caterpillars making them more likely to be selected, they crucially were able to demonstrate that the presence of a guarding caterpillar significantly decreases the likelihood of the wasp larvae being eaten by predators. This means that the caterpillar's behaviour is most probably adaptive for the wasp: that is, it carries an advantage upon which natural selection can act. One question that arises from this curious case is what finally kills the babysitter. Could it be lack of food, or expenditure of energy in its guarding behaviour, or even a result of the injuries it suffered when the larvae moved out? These explanations don't explain why the deaths consistently occur just after the adult wasps emerge from their cocoons. While it is known that parasitoid larvae can affect the endocrine system of the host, it's thought that the wasp larvae do not produce enough substances to so dramatically affect the caterpillar for such an extended period, especially since the caterpillar only begins its head-waving defence an hour or two after the wasp larvae have exited from it. Janssen and his team suspect they know the answer. When they dissected caterpillars from which the wasp larvae had departed, they found one or two larvae had stayed behind. These, they hypothesise, remained in order to control the caterpillar. A similar system has been found in parasites of ants. Species of liver fluke (and of trematode) spend part of their life cycle in ants, and when their siblings move on, a couple remain, migrate to the brain, and form cysts that are thought to change the ant's behaviour for the benefit of their kin. If they're right about this, then the Thyrinteina leucocerae caterpillar is not the only victim of the Glyptapanteles' elaborate strategy. So are some of the wasps' own siblings—an example of kin sacrifice and host cost. Brilliant! Margaret, you've done a great job of explaining this phenomenon, and before that making references to other kinds of parasitism to show how widespread it is. Parasites modifying host behaviour really is cool. There must be very complex interactions in play - and since, I'm sure, we don't know much about insect neurology, it'll take some time to understand how the behavioural changes are caused. I'd love to know what the neurological bases of the behavioural changes are. Maybe this is what you should do your PhD on? Oh, I don't know. I rather like taxonomy, and it's what I'm heading towards at the moment. Maybe a post-doctorate. Well, that's good. Taxonomy desperately needs new practitioners. In a decade or two, when science realises that there's no one left to identify species, the universities will be clammering for you to teach it.